Once again, it’s time for our monthly Licorice of the Month Club reviews. This time, the good folks over at Licorice International sent out some black licorice pipes which I’ve already reviewed (that didn’t stop me from loving them – again) and some red and black licorice laces. I have to admit that I wasn’t overly impressed with the red laces when I first tasted them. I found them very hard to chew and overall not really worth the effort. With that experience, I put off tasting the black for a later date. A few days later, I returned to the package and resolved to try again. I was so glad I did. The second time around, I started with the black. By the feel of the package, they were very soft and moist. Tasting bore out those observations, and my mouth was pleased with the soft, slightly salty, easy to chew licorice. If you’re after a less sweet, more salty licorice, this is the way to go. It’s not nearly as salty as the true Dutch salt licorice, but it’s still less sweet than we Americans are used to. After that excellent experience, I decided to give the red another chance. To my surprise, the texture had actually improved! 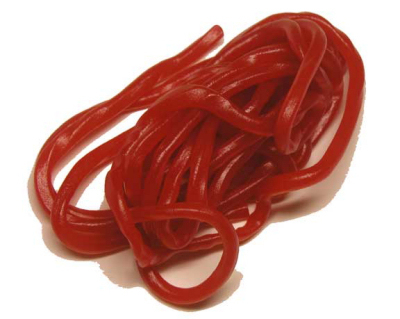 The laces were now softer, much easier to chew, and actually an enjoyable experience. Like most red licorice, I can’t really give a specific fruit flavor to this treat, other than “red.” They were very sweet, slightly fruity, and pretty much typical of red licorice in general. Overall, I can’t say that either black or red is going to blow your socks off in terms of flavor. But, if you’re looking for something fun that lends itself to interesting and creative means of consumption, these are definitely a good choice. I found myself having more fun figuring out ways to tie knots, divide into shorter segments, tie things up, and do other silly things than I did actually eating the candy. That’s not necessarily a bad thing!